Any experience with the stainless steel bucket fermenters? I was researching these fermenters recently. These are not conicals, and they are a lot cheaper too. 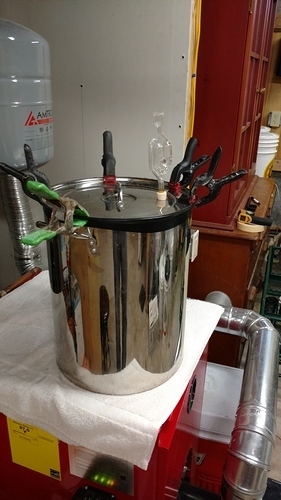 Chapman makes a 7 gallon with or without a port that looks like a 3 piece ball valve. No pictures of the inside, so I'm not sure if it's a welded or weldless fitting. I'd be concerned with a weldless fitting both from a hygiene and leak risk. Not sure if it has a dip tube either. Anyone else have experience with non-conical stainless steel fermenters? Basically sounds like a kettle. I recently fermented in a stainless kettle with great success. As far as the ball valve the pot I used didn't have one I just racked to a keg as normal. Without it being a conical you probably wouldn't want a dip tube because you want to drain off the beer above the yeast. A conical you could get the yeast out then drain the beer. @brew_cat Did you ferment in the same vessel you boiled in? Open fermentation or with the lid on? How long before you racked?